The construction of the Dera Baba Nanak-Kartarpur Sahib corridor across the India-Pakistan border has been likened to the fall of the Berlin Wall by Prime Minister Narendra Modi. Here's why the corridor is important. 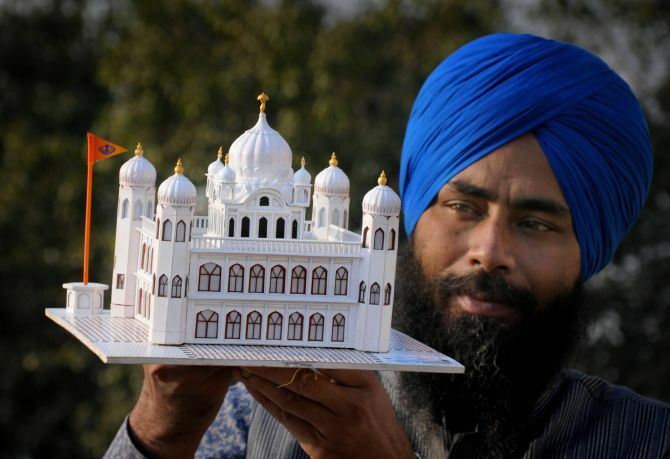 Why is Gurdwara Kartarpur Sahib sacred for the Sikhs? It was established by Guru Nanak Dev, the founder of Sikhism, in 1522. The first gurdwara, Gurdwara Kartarpur Sahib, was built there, and Guru Nanak Dev is said to have died there after spending more than 18 years of his life in Kartarpur. It is only fitting that the initiative has been given the nod on the 550th birth anniversary of the Sikh guru. What is the significance of Kartarpur corridor? Both India and Pakistan have announced that stretches would be developed in their respective areas, linking Dera Baba Nanak in Gurdaspur with the Gurdwara Darbar Sahib Kartarpur in Pakistan. The corridor, once built, will give Indian pilgrims easy, visa-free access to the shrine in Pakistan. The length of the corridor will be four km, that is, two km on each side of the border. Indian pilgrims will be given visa-free access to the gurdwara, making it the first such cross-border initiative between the two nations. It is also expected to strengthen people-to-people contact. How did India and Pakistan reach an agreement on building the corridor? There had been a longstanding demand in India to open a corridor between Dera Baba Nanak shrine and Kartarpur Sahib. During the 1999 visit of then Prime Minister Atal Bihari Vajpyee to Lahore, it was proposed that visa-free access to be granted to Sikh pilgrims to visit the shrine. India and Pakistan agreed to the proposal soon thereafter. In 2010, then chairman of the Pakistan Evacuee Trust Property Board, Sayed Asif Hashmi, offered to complete the required modalities for the construction of the corridor once India also agreed in principle on the same proposal. However, no official announcement of opening of the corridor was made from either side. In May 2017, the parliamentary standing committee on external affairs ruled out the construction of the corridor, citing poor state of relations with Pakistan. Why did the issue regain focus? In August this year, Punjab minister Navjot Singh Sidhu had come under fire from opposition parties after he visited Islamabad to attend the swearing-in ceremony of newly-elected Prime Minister Imran Khan and hugged Pakistan Army chief General Qamar Javed Bajwa there. In his defence, Sidhu had claimed that he did so as Bajwa told him that the Pakistan government was working for the opening of the Kartarpur corridor. However, in October, the Pakistan foreign office said that the opening of the corridor will be delayed until there are talks between the two countries. The statement came after India called off a proposed meeting of foreign ministers on the sidelines of the United Nations General Assembly. On November 22, the Union cabinet cleared a proposal to develop the corridor. The decision coincided with the 549th birth anniversary of Guru Nanak Dev. Hours later, Pakistan Foreign Minister Shah Mahmood Qureshi said Islamabad has conveyed to India its decision to open the Kartarpur corridor. The ministry of external affairs sent a letter to Pakistan, urging it to construct the corridor on its side. Vice President M Venkaiah Naidu and Punjab Chief Minister Capt Amarinder Singh laid the foundation stone for the project on the Indian side on Monday. On November 28, Pakistan Prime Minister Imran Khan will do likewise. Prime Minister Narendra Modi hoped the Kartarpur corridor would act as a bridge between the peoples of India and Pakistan that might lead to a better future as he referred to the fall of the Berlin Wall to underline the importance of people-to-people contact. The prime minister referred to Partition saying, "What has happened in 1947 has happened." However, Punjab Chief Minister Amarinder Singh declined Pakistan's invite to attend the ground-breaking ceremony for the corridor, citing terror attacks in his state and killings of Indian soldiers by Pakistan troops as the reason. It was also reported that Sikhs visiting Gurudwara Nankana Sahib in Pakistan on the occasion were not allowed to meet Indian high commission officials. However, now that the corridor has been announced, sources say that India wants no restrictions on the number of pilgrims. They also said there must be free and readily available consular access for Indian citizens on the Pakistani side. Moreover, India wants the corridor to be kept open for 24 hours on all days.